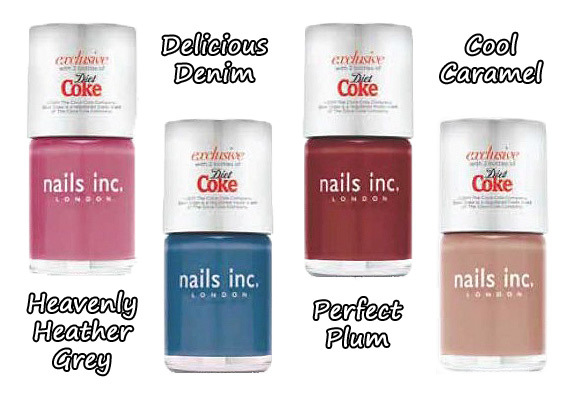 … collect all the new Nails Inc./Diet Coke promo shades! I’m actually off Diet Coke at the minute… not out of choice I hasten to add. This is one of those dietary reasonings *rolls eyes*. However, I’m not going to let a silly little thing like that stop me from getting my hands on all four of the limited and exclusive Nails Inc. shades! Each bottle is full size (10ml) and to get your grubby hands on one you need to buy two 500ml bottles of Diet Coke from a participating Boots store (the polishes are usually located on display stands nearby). The promo started on Wednesday but I haven’t noticed these in my local store yet which makes me think I may have to travel into town to take advantage. They don’t call me Dora the Explorer for nothing! Or… actually… at all. Which one will you be going for first? Boots Deal Alerts Nails Inc. I got the caramel one yesterday Haven’t used it yet, as I have a broken wrist and it’s too much trouble! i managed to get the heather grey one today but the only had that and caramel. i really want the blue! More Nails Inc cremes…Afraid I can’t get excited by these. And I’m not a Coke-person either so a thumbs-down from me. i have just got caramel and heather grey i have just posted swatches if anyones interested. Got Caramel yesterday and am going to check out Denim Blue tomorrow. If you’re going to drink coke, don’t drink diet. It has so many chemicals in it and they slow your metabolism. Regular coke is actually better for you, even if higher in calories. Gotta love having friends going to school for nutrition! ah totally forgot about this, need to pop in my boots soon! Totally hate Diet Coke but bought them anway for the nail varnish, lol. I got the Denim one, but am yet to try it out. I absolutely love the blue colour. I picked up the Caramel one today, it’s all they had in boots Piccadilly though interestingly I poked my head into the charing cross one on they way home and they only had caramel but they also had paris and milan from last years lot. Only heard about this evening. Am totally heading to my nearest Boots tomorrow to stock up on some Diet Coke (“,) Are you allowed to buy them all or is there only so many per person?? Soo pretty, I’m having a tough time finding out online which stores are having this promotion? I live in the north of the UK (but not so far that are aren’t cities…we always get overlooked!) and I have a feeling even if I go to a bigger city, I won’t be able to grab these. If you're a Space NK regular, don't forget to N.Dulge! Recreating a salon blow dry - the follow up!